Cast of “Unnecessary Farce” in rehearsal at the Center for Creative and Performing Arts Theater at GTCC’s High Point Campus. 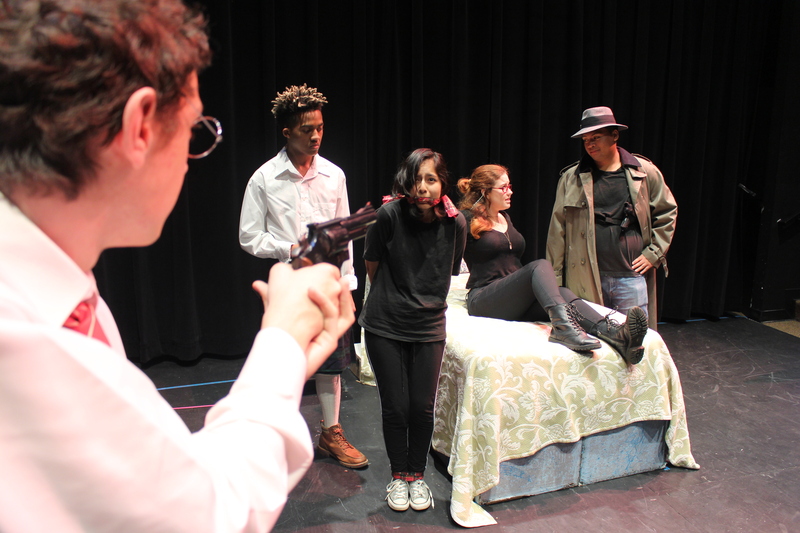 Pictured from the left: Aaron Summey as Officer Eric Sheridan, David Merritt as Todd, Cristal Zeballos as Officer Billie Dwyer, Katie Romberg as Karen Brown, Carlo De Leon as Agent Frank. HIGH POINT, N.C. — Guilford Technical Community College Performing Arts Theatre will present its spring production, “Unnecessary Farce,” April 5-7 and April 12-14 at the Center for Creative and Performing Arts on GTCC’s High Point campus. All performances will begin at 7 p.m. Farce is a type of comedy that uses highly exaggerated and improbable events in the plot. The situations are humorous because of their ludicrous and often ridiculous nature. “Unnecessary Farce” is an award-winning stage comedy by Paul Slade Smith that combines the elements of classic farce with a contemporary American plot. In an economy motel room, an embezzling mayor is supposed to meet with his female accountant. In the room next door, two undercover cops are supposed to catch the meeting on videotape. But there is some confusion as to who’s in which room, who’s watching the video, who’s taken the money, who’s hired a hit man, and why the accountant keeps taking off her clothes. “Unnecessary Farce” is produced and directed by Joshua Waterstone. The seven-member cast includes: Aaron Summey, Cristal Zeballes, Kat Romberg, Rodney Terry, Carlo DeLeon, David Merritt and Glenice Woodard. Members of the crew include: Ryan Daw, lighting designer; Jacob Flyth, scenic assistant; Carlo DeLeon, sound designer; Aaron Summey and Kelsey McGuire, costume designers; Teddy Schroemer, stage manager; Devon Washington, props master; David Glover, GTCC adjunct faculty, as scenic designer and technical director; and Jody Tidwell, GTCC adjunct faculty, as lighting mentor. Tickets are available for purchase online or at the door. Cost is $15 (general admission); $10 (GTCC faculty, seniors and veterans); and $5 for students. All performances will take place at the Center for Creative and Performing Arts Black Box Theater at GTCC’s High Point Campus, 901 South Main Street. For more information, contact Joshua Waterstone at jswaterstone@gtcc.edu or call (336) 334-4822, ext. 50299. Visit http://theatre.gtcc.edu for more information.